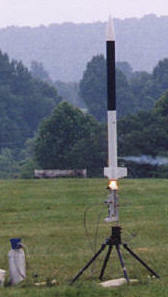 A hybrid rocket motor uses a solid fuel and a liquid oxidizer. Sport hybrid motors use nitrous oxide (N20 or NOX for short) as the oxidizer. Nitrous oxide has the advantage of being about as safe as any propellant can be. N2O is not classified as a flammable gas; it supports combustion. It is treated as a compressed gas and can be safely stored in common pressure vessels. N2O is widely used in high performance cars and can be purchased at speed shops. Hybrid motors can use different materials as fuel. The AeroTech hybrids use cellulose (paper!) for fuel. The HyperTEK system uses a formed plastic grain. RATT Works and Propulsion Polymers motors burn polypropylene, and West Coast Hybrids fuel grains are PVC. Hybrids have been fired with fuels like plexiglass, grocery bag paper and hard salami (truth!). One big attraction of hybrids, along with the "neatness factor" of using a liquid oxidizer, is the fact that none of the propellants are explosives, and therefore do not require permits or licenses for storage or use. We endorse the Safety Codes of the National Association of Rocketry and the Tripoli Rocketry Association, which limit hybrid motors to members qualified to Level 1 and above. H hybrids can be used to qualify for Level 1 certification. Check their web sites for more information. Three types of hybrid motors. There are three basic types of hybrids available to hobbyists today. Aerotech hybrids are filled before they are installed in the rocket. They are not currently in production but are still certified for use. We support owners of Aerotech hybrid hardware wherever possible with the limited stock that is still available. Floating Injector hybrids (sometimes called Urbanski/Colburn or U/C Valve hybrids) are available in different sizes from different manufacturers, including RATT Works, Propulsion Polymers, West Coast Hybrids and SkyRipper. HyperTEK hybrids are manufactured by Cesaroni Technologies and are available in 39 different certified combinations. We sell and support them all. Here is a short article describing the systems and what you'll need to get started with each one. How do the "floating injector" motors work? The RATT Works and Propulsion Polymers hybrids are beautifully simple devices. Instead of a separate tank, there is one long tube with the propellant grain and a bulkhead at the bottom. Everything above this bulkhead is the oxidizer tank. A nylon hose connects to the injector in the center of the bulkhead. A small grain (less than 1/2 oz in the H motors) of conventional solid propellant sits at the top of the fuel grain, with the nylon hose going through a hole in its center. To prep the motor, you attach the hose to the injector with a pressure fitting. Then you drop the solid propellant "preheater grain" into the top of the polypropylene fuel grain. Lead the hose through the hole in the igniter grain and fit the injector in place. Fit the nozzle to the other end of the fuel grain. Now insert the whole business into the bottom of the motor casing. A closure threads over the bottom of the casing to hold in the fuel grain assembly and nozzle, and act as a thrust ring. Finally, the top closure goes into the other end of the motor casing, and a line is connected to the vent in the closure. To launch, you insert a conventional igniter into the fuel grain until it makes contact with the preheater grain. Then you connect the hose and the igniter to our RTLS fill system. Back at the control box, you hit the Fill switch and N2O flows into the motor. The air in the oxidizer chamber comes out the vent as the liquid nitrous comes in through the injector. When you see liquid nitrous coming out the vent, you're tanked. Count down and hit the ignition button. The igniter starts the preheater grain burning, which cuts through the nylon hose. This releases the N2O into the combustion chamber and preheats it. You're on your way! Floating-injector hybrids have one thing in common with conventional solid rocket motors: the preheater grain. There is a hybrid system that is completely independent of conventional solid fuel technology; in fact, there are no pyrotechnics involved. This is the revolutionary HyperTEK system. HyperTEK motors have three components: a NOX tank, a plastic fuel grain, and an injector bell that connects the two together. The fuel grain is part of the structure; the nozzle is molded into it, and the walls are thick enough that they don't burn through. This gives you a very versatile system. You can attach different sizes of tanks to the injector. The injector itself has an interchangeable orifice. And there are two different kinds of plastic used to mold the fuel grain. There are 39 different certified HyperTEK motor combinations, from I through M! The truly unique part of the HyperTEK system is the way the motors are filled and ignited. A special attachment called a "fill stem" is mounted on your launch pad. This supports two tubes, one inside the other. The inner tube is the longer of the two. You lower the rocket down over the fill stem, and the longer tube goes up into the injector bell. The rocket is secured to the fill stem with plastic tie straps. When you command Fill, NOX flows through the longer tube, through the injector into the tank. The tank is vented to allow air to escape as the liquid NOX flows in. When you see a plume of liquid NOX coming out the vent, you know the tank is full, and you start the ignition sequence. At ignition, two things happen. First, gaseous oxygen (GOX) flows from a supply tank up through the shorter tube of the fill stem and into the combustion chamber of the motor. Second, a high voltage transformer generates an electrical arc across the cut end of a wire that has been mounted in the combustion chamber. In the high-oxygen atmosphere of the chamber, this arc is enough to ignite the propellant. The flame of ignition burns through the tie straps securing the fill stem assembly, which drops out of the motor, releasing the NOX into the combustion chamber. You're on your way!